Rail is coming uptown to the area around Karangahape Road. The new station in Mercury Lane (above) will be the deepest of the CRL stations at 32 metres deep and it will have 150m long platforms. The underground platforms will go as far as Beresford Square where there will be another entrance. The Karangahape Station will be great for the area. The redevelopment will unlock additional high-density residential capacity and generate urban renewal within the inner-city fringe catchment. This will provide housing stock to help reduce Auckland's housing shortage over time. We've created a fly-through video (below) so you take a journey through the new Karangahape Road Station. Here are a few things to keep an eye out for when you take the tour. In our video below, you'll head down Mercury Lane where you'll see the new station building next to the Mercury Theatre. A further entrance is planned at Beresford Square and you’ll see us exit there. In July 2018, Auckland Council and the Government agreed to future proof the City Rail Link and expand station sizes to cater for rocketing growth in rail patronage across Auckland. In the video, you'll also approach the station from one of the side streets, Cross Street, which is parallel to K Rd. The station will stimulate new development around the area so you will notice a new building above the station and similar new buildings in the foreground. These are concepts of what is possible. Living so close to a train station will be popular. The station site measures about 2,600sqms of developable land owned by CRLL so once we finish, there is much potential for development in the land we needed during construction. You'll see a new pedestrian mall which will run alongside the station between Mercury Lane and East Street. In the video you will wander down that area. As you enter the Mercury Lane entrance, note how it evokes the branching arms of the vast spreading canopies of Kauri trees, radiating out from massive trunks. The entrance provides a dramatic sense of relief via a series of large climbing patterns that are revealed as commuters pass through the space towards the entrance. The overall experience is one of rising from, and descent into, the earth. It is proposed that light and sound will be used to enhance the experience of the entrance space. The City Rail Links’ design partnership with Mana Whenua has resulted in the incorporation of many cultural references in the architectural expression narratives all the stations. The Maori creation story has influenced the CRL station entrances, each telling the story of Ranginui, the sky father, and Papatuanuku, the earth mother. Their close embrace was separated by their son, Tane Mahuta, who in pushing them apart to bring light (Te Whaiao) into the world and, the state of creation into being (Te Ao Marama). Each station entrance emphasises, through the architecture and materials, the relationship between solid earth on the ground and the sky above the entrance. The entrances express the deity identified for each location representing the unique identity of the station. As commuters travel through the station to the platforms at Karangahape station, the experience is intended to be just as exciting as the entrance experience. The design proposes the use of modular lining panels that offer dramatic relief in their form, acoustic absorption by their pattern, and the incorporation of subtle colour differences that reflect the geotechnical layers of the earth as people descend to platform level. 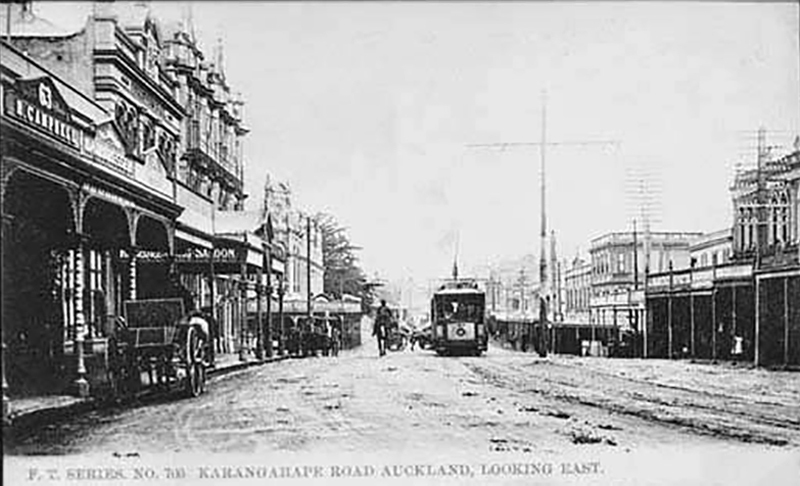 The name ‘Karangahape Road’ stems from ‘Te Karanga a Hape’, the welcoming call of Hape who according to Te Wai o Hua arrived on a stingray prior to the Tainui waka and welcomed his relatives to Tamaki. As it was a travel route used by the pre-European Maori, Karangahape Road is an older thoroughfare than Queen Street, which was developed by Europeans in the 1840s. The Karangahape ridge and valley to the South was a rural area outside the town of Auckland until well into the 1860s. Under consideration is calling the station Karanga-a-hape and you will see this written in several places in the video. MERCURY LANE: The Mercury Theatre is on the left. The theatre, originally called The King's Theatre, was opened in 1910 as the country's first purpose built picture and performing arts theatre. (Photo: Sir George Grey Special Collections, Auckland Libraries, 1407-133). The Karangahape ridge and the valley to the south was a rural area outside the town of Auckland until well in to the 1860s. However, the elevated north facing slope attracted wealthy settlers who built substantial houses - the first Government House was built on this ridge. The Maori track along the ridge was the main route to the north and was developed into a road joining Great North Road. 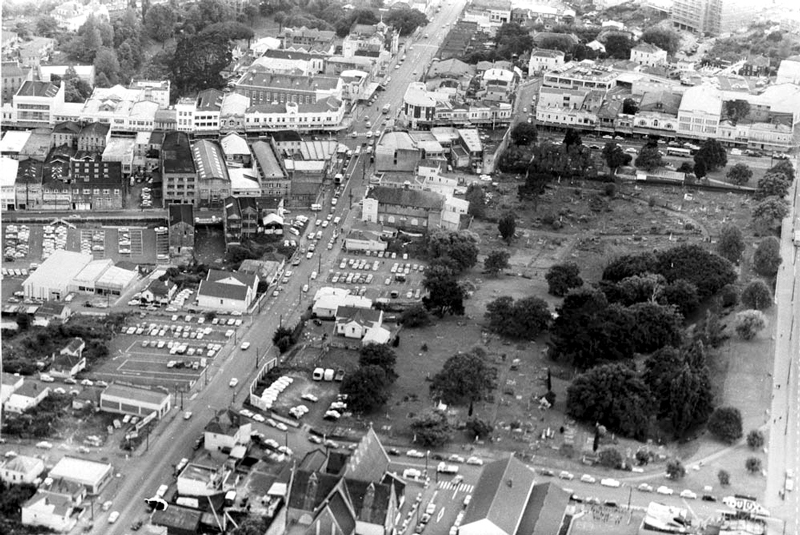 It was this traffic that attracted shops and other business to the crossroad of Pitt Street, Karangahape Road and Mercury Lane. This area, outside the main settlement but close enough to the centre of the city, was ideal for large sections to be allocated by the Crown to religious groups. Some still remain in the area today such as the Wesleyan or Methodist Church (1866), on the Pitt Street corner and the beautiful Hopetoun Alpha in Beresford Square, built by the Congregationalist Church in 1875. In 1882 this area became part of Auckland City and over the following four decades Karangahape Road became a significant shopping area. The replacement of horse drawn trams by electric trams in 1902 added to the attractiveness of the area for shopping and brought people from outlying areas. Virtually all the tram lines from the outer boroughs travelled the Symonds Street or Karangahape Road routes. After WW1, Karangahape Road developed a more sophisticated reputation as larger specialist stores appeared, supplementing the smaller shops that still supplied the local population. The Naval and Family Hotel on the corner of Pitt Street dates from 1897, although there is evidence that a hotel was on this site in 1865. The department store, George Courts, opened in 1914 on the corner of Karangahape Road and Mercury Lane. 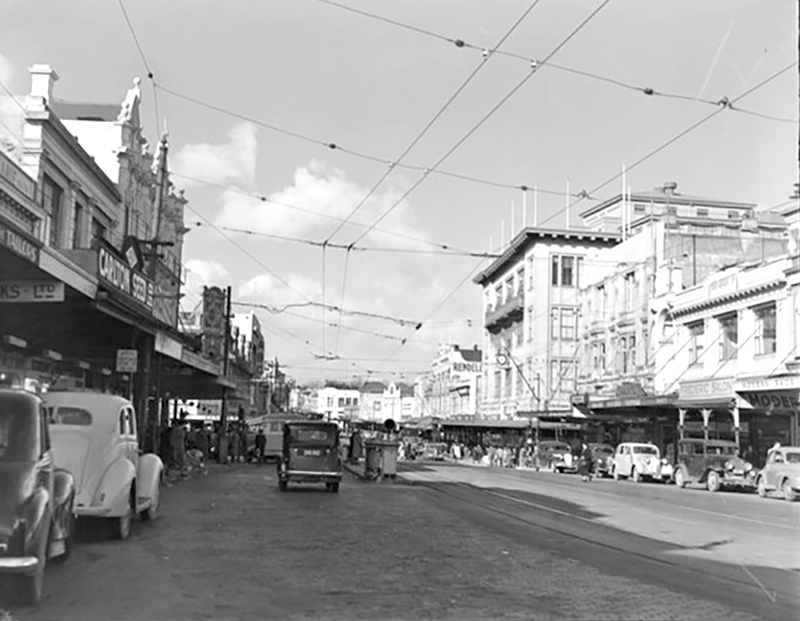 The Karangahape Road area also became a centre of entertainment. Mercury Theatre was built in 1910 and in the 1920s cinemas and dance halls were popular. In the latter half of the twentieth century red light businesses were attracted to the area. The Auckland City Fire Station was built on the corner of Grey and Pitt Streets in 1901 on a site formerly occupied by the Lennox family home. The St John Ambulance Station across the road was begun in the same year as part of the Fire Station complex. It was built in stages with the Beresford Street building erected in 1912. Designed for horse drawn fire engines, it enclosed a central courtyard with a large arched entrance. The tower was intended as a lookout over the city and for drying hoses. The Beresford building was converted to private dwellings in the 1990s. Indian and Chinese traders have always had business in the area. Further diversity of the population occurred in the 1960s and 1970s with the arrival of Pacific people in New Zealand. Many settled in the Ponsonby and Karangahape Road areas. Shops and other businesses selling island produce and clothing were set up to cater to this community. The Polynesian population replaced working class families who had left for the suburbs. The department stores and other large businesses that dominated the street gradually relocated to suburban hubs or disappeared. The Newton end of Karangahape Road was cut off by the motorway excavation which removed an entire block of shops. 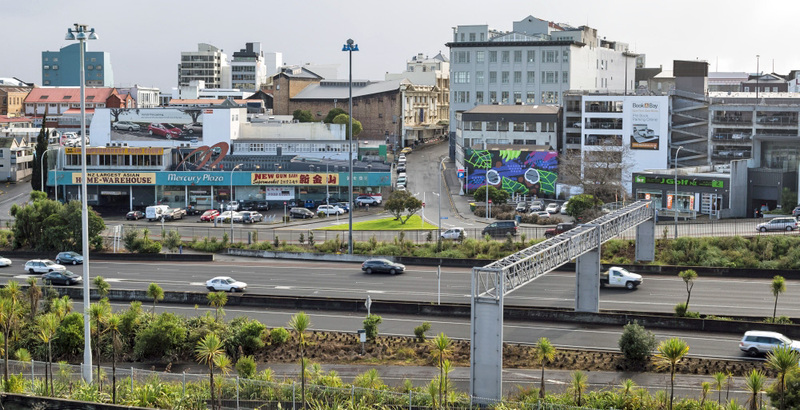 The overbridge disrupts the continuous range of retail shop fronts that previously lined Karangahape Road unbroken from Symonds Street to Ponsonby Road. Trams used to take passengers from Karangahape Road to Wellesley Street. This is film of trams in 1949 around the Karangahape Road and Queen Street intersection and the Baptist Tabernacle.